Feeling inspired to paint a room or the exterior of your home? Do it! Adding color to your home is the single best way to make the most dramatic effect, and is also the most affordable! But, as anxious as you might be to dash to your nearest paint store, select a color off the sample swatches, then dive straight into your project, don’t do it. You can save yourself a lot of time, labor and investment by just planning ahead a little. And, if you hire a painting contractor to do the work, this planning could really save you some money! Test It ~ Holding a little 2” x 2” paper sample up against the wall does not give you the visual impact the color will make, nor show you the subtle undertones (ever seen a taupe that looked pinkish?). Most paint companies are now offering 2 oz. sample containers of their most popular colors, but I have not found these to be effective because they don’t cover a large enough area, and with two coats. And Test it Large! ~ So, here’s where you invest a few dollars, but it really pays off. Once you’ve chosen the colors you’d like to sample, purchase a quart-sized can (and Benjamin Moore offers pint-sized sample cans). I normally find the smallest wall in the room and paint the whole thing ~ floor to ceiling, next to a doorway or window, and always paint two coats (with a mini-roller) so the existing color doesn’t bleed through. This not only gives you an idea of the impact the color will have in the room, but colors also reflect off of each other, and the existing color in the room will reflect onto your otherwise small sample, thereby altering its appearance. If you’re not up for painting that much, at least apply a 3′ x 3′ area. And if you’re testing multiple colors, paint them on opposite sides of the room, or several feet apart. It’s important to see a color alone vs. how it compares right next to another. Go Portable ~ The second option I use with clients is to paint a 2’ x 3’ foam core or poster board. This enables us to move it to various parts of the room to check for appearance in sun, shade, etc., or makes it easier to view if you’re using the same color in multiple rooms. Don’t Rush It ~ Once you have your samples done, take some time to live with them, and for at least a 24 hour period. If you’ve made a dramatic color change, you may love it initially, but then realize after a few days that you don’t want to live with it long term. Look at your new color during various times of day, at night, and with whatever artificial lighting you have in the room. If the sky is cloudy that day, give yourself the chance to see the color on a sunny day. You may discover that what looked like a beautiful gray-taupe in the evening is looking pinkish in the morning sunlight. I hope you found these tips helpful! Choosing the right colors can be overwhelming with the thousands of choices available, so if you’re feeling a bit stuck, my Designer Download® can help you narrow the field! 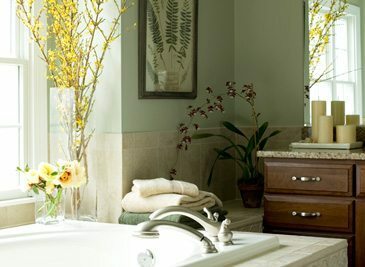 Just use the contact form or give me a call, so I can help you choose the perfect colors for your home ~ the first time! It is good advice! I found my color but I am still working on the degree / depth of that color I want in the room. Love your blog. Great advice! You’re right on the money Cathy! We took your advice on the quart size ‘sampler’ and it made all the difference for our recent paining project. I did big 2’x 3′ squares on different walls and boy did the colors look different than the 5 x 8 sheets from the store. We ended up totally nixing options that we were convinced we’d love but not once it actually got on the wall. Thanks for saving us the time, money, and disappointment! I lived with a man who was afraid of color for years. It drove me crazy. When he left, so did my sentence of living with all white walls! Now there is color in all areas of my home. I agree with the idea of doing a sample wall or with the large sample square and live with it for a week. Look at it at all different times of day and with different lamps on. It’s amazing to me how much the color changes. Go BOLD! It’s only paint. Don’t like it….zap it with a layer of Kilz and try again!